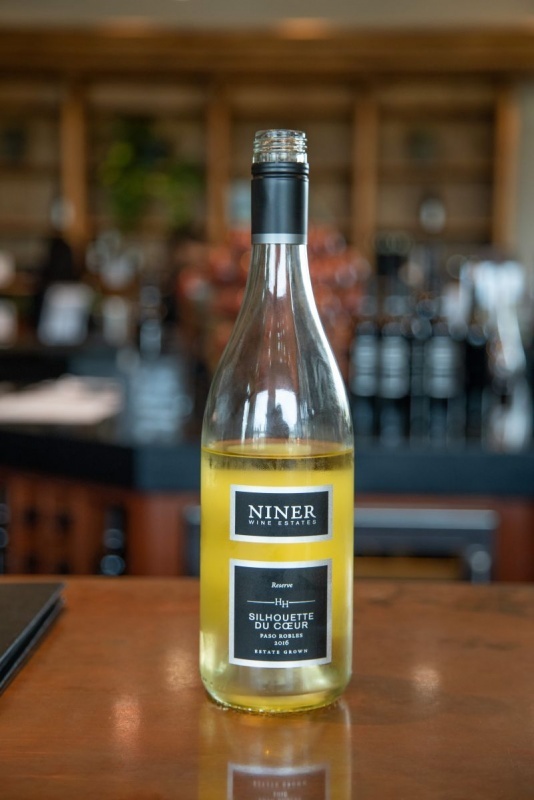 Niner owns three vineyards, all within thirty miles of the winery. All of their wine is from fruit grown on this trio of vineyards. 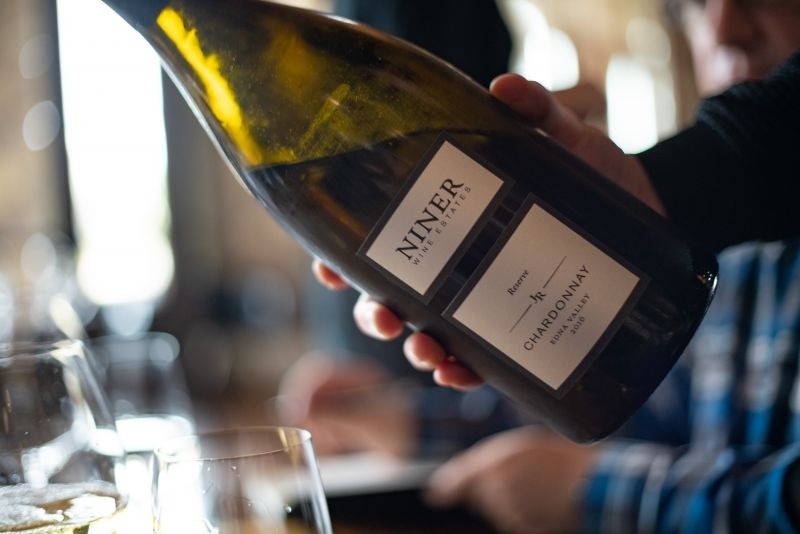 Niner employs two winemakers. Molly Bohlman makes Pinot Noir and Chardonnay. Patrick Murhan makes wine from the other seventeen grape varieties that grow on the Miner properties. There are between twenty-five and thirty different wines that Miner make. These wines fit into one of three tiers: Fogcatcher, Reserve, and Estate. 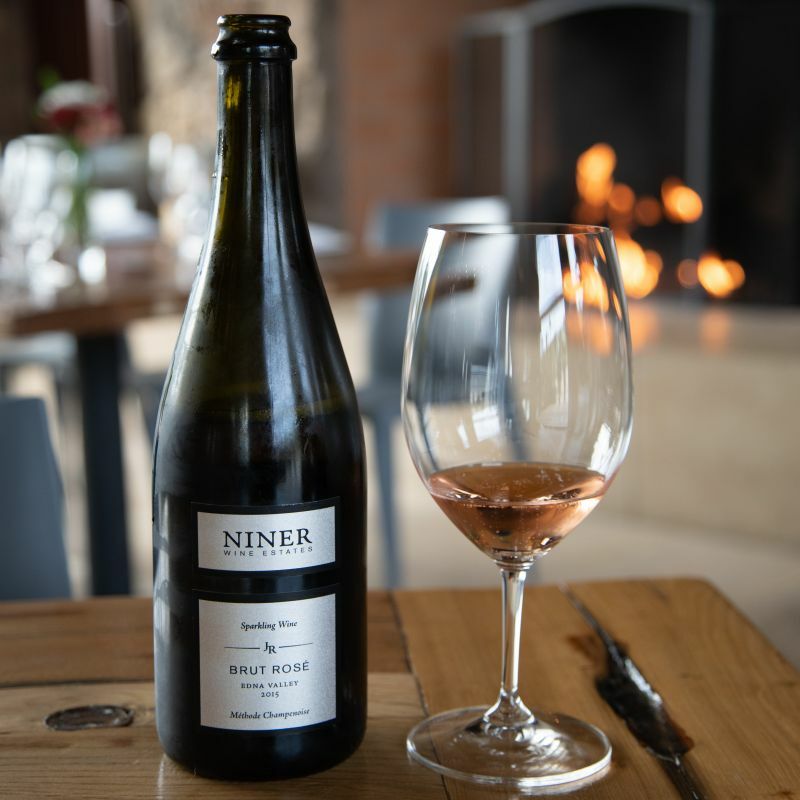 We really loved the Niner Brut Rosé. We started with the 2015 Brut Rosé ($65). The nose was of ripe strawberry. Those aromas lifted by lively bubbles. The wine had flavours of fresh green apple. It was very dry with good acidity and just a hint of yeast. The sparkling wine is made in house and hand-riddled. What an incredible white wine – lovely texture. Our next taste was of a Rhône style white. This was a blend of Marsanne, Roussanne, and Grenache Blanc. The bouquet was subtle; flint with floral hints. The wine was crisp. My initial impression of apple and honey balanced by salinity and minerality. In the mid-palate, a creamy texture emerged. In a long finish, the acidity morphed from apple to citrus. This was a delightful wine. It offered further proof, after our visit to Cambria, that the Central Coast makes intriguing white wine. The wine ages for a year in large oak barrels. Our first red wine was the Pinot Noir from their Jesperson Ranch vineyard in Edna Valley. The nose was a traditional Pinot Noir bouquet; earth and cherry. The wine was lush. Cherry, blackberry, and cedar combined to give a touch of sweetness. Well- integrated dusty tannins led to a long, delightful finish that hinted at vanilla. In the days before we visited Niner, none of the Pinot I had tasted was memorable. Here was one that broke that trend. 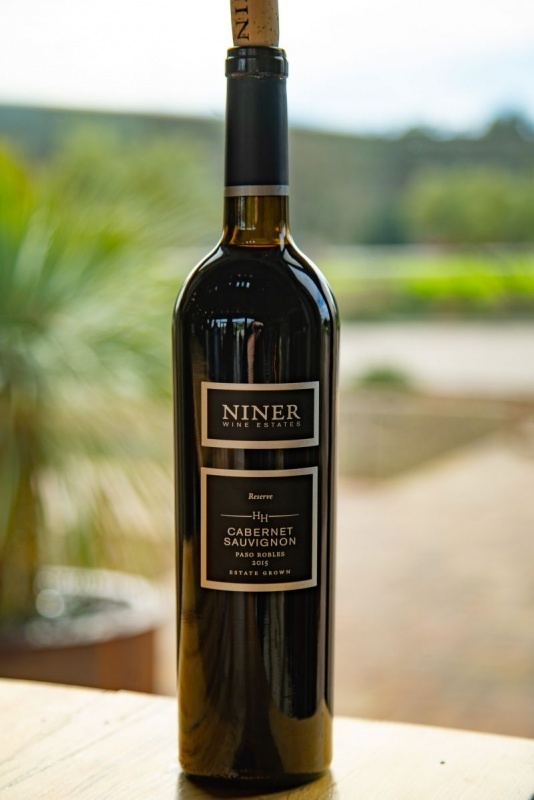 The Niner Wine Estates Cabernet Sauvignon knocked our socks off. Next up was the 2015 Reserve Cabernet Sauvignon. Aged in 100% French oak, with about half of it new. Lifting the glass, I was met with intense aromas of brambles and vanilla. The wine was tannin-heavy, with flavours of cassis and forest fruit. Raspberry notes emerged in the mid-palate. The finish dominated by the dusty tannins. This is a wine made to age. The last wine of the tasting session was the 2015 Fogcatcher, which is a Bordeaux blend. Unusually, for such a blend it includes Carménère. This grape originates in the Médoc and is one of the six original Bordeaux varieties. Now it is associated with Chile. The individual varietals age in barrels for fourteen months. Then the winemaker selects the best, blends them, and returns them to the barrel. The nose was intense with aromas of blackcurrant and pepper. A luxurious velvet mouthfeel supported by good acidity was a delightful first taste. A complex flavour profile provided blackcurrant, plum, sprinkles of pepper, and hints of mint. Well integrated, earthy tannins rounded out an outstanding wine. 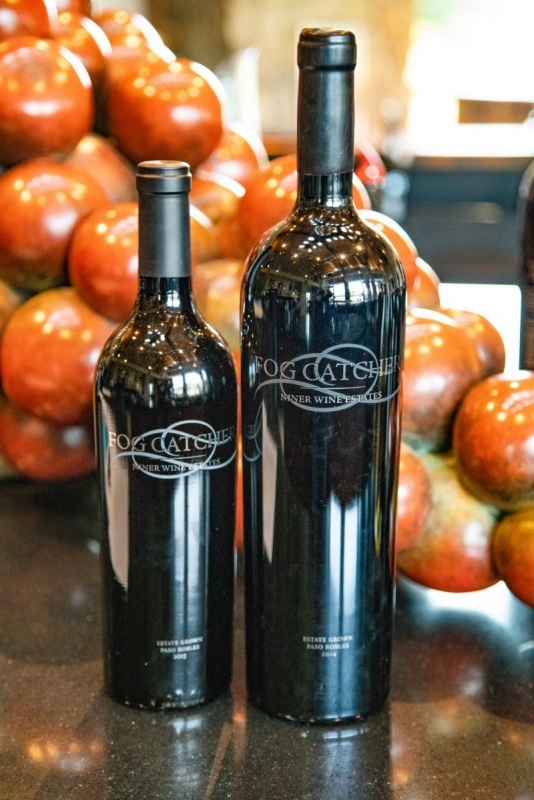 The blend is 30% Cabernet Sauvignon, 14% Malbec, 22% Petit Verdot, 14% Cabernet Franc, 5% Carménère, and 5% Merlot. After our tasting, Andy Niner led us on a brief tour of the winery’s grounds. There was plenty of patio space to enjoy a tasting outside. Since it was January, the patio was not in use. 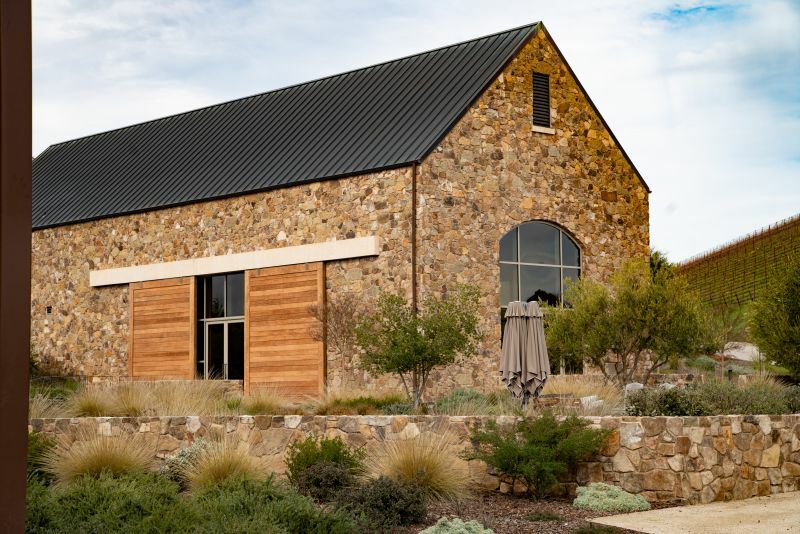 Unlike Napa wineries, Niner has a permit for a restaurant on the winery premises. Andy took us through a chef’s garden, which provides fresh ingredients for the kitchen. Lunch provided an opportunity to try a few more of the Niner wines. 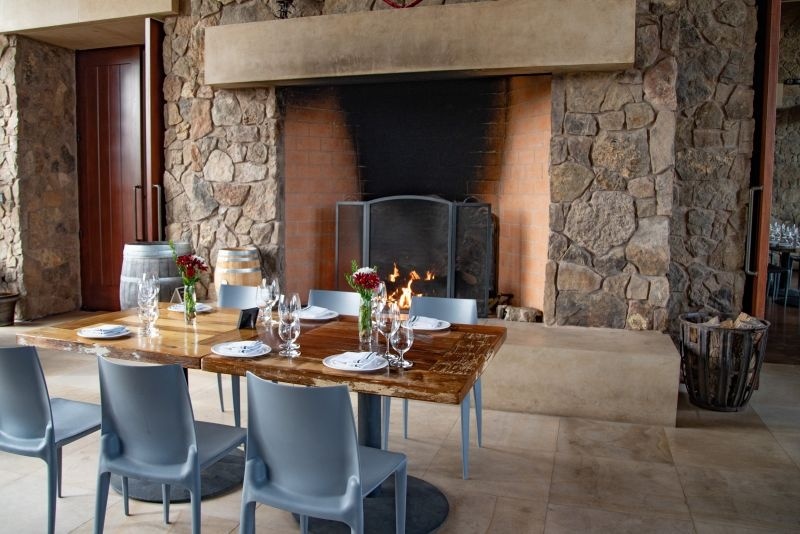 A full range of their wines, by the bottle or the glass, are available in the restaurant. Chardonnay was served with lunch. The first wine we tried with lunch was the 2016 Chardonnay from Edna Valley. The nose offered vanilla and lemon. It was served too chill for my liking. Once it had warmed up a little, I found flavours of pineapple and vanilla. It was a little low on acidity. Whilst it was not overly oaked, nor very buttery, it lacked the austere style I prefer in this varietal. 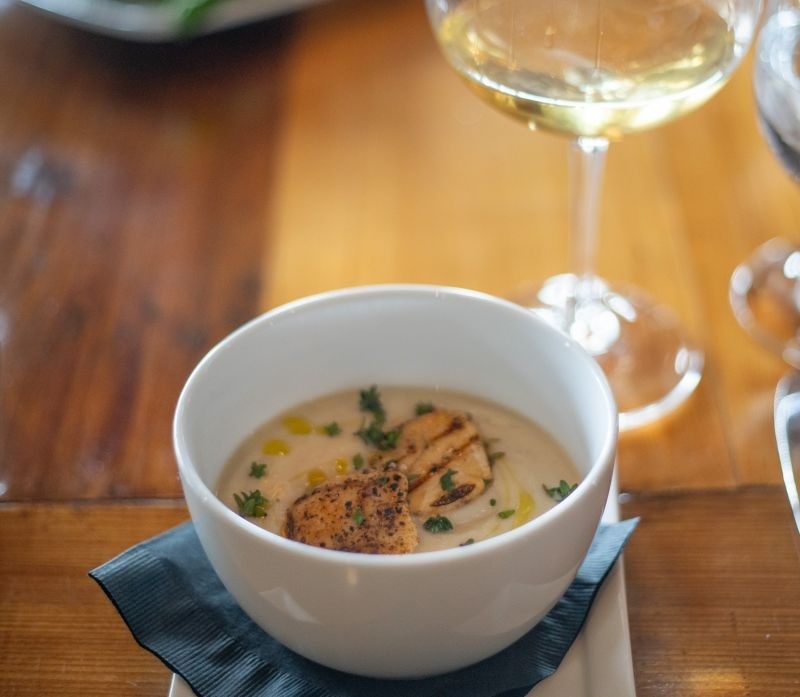 The scallop soup paired with the Chardonnay lifted the wine. We also tasted the octopus. 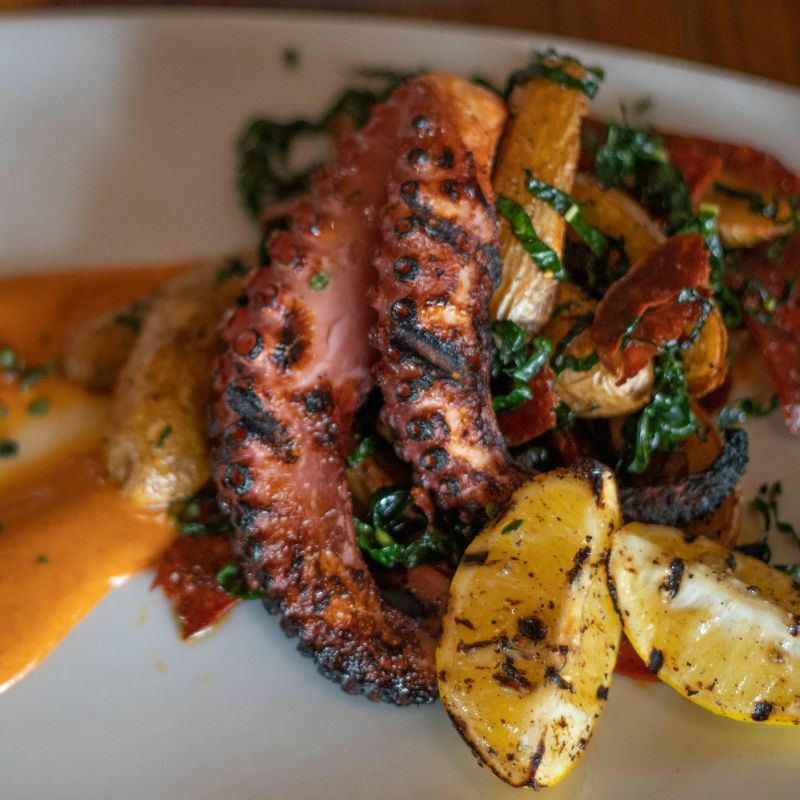 The chef prepared this dish sous-vide with melted chorizo, lemon, parsley, thyme, grilled fingerlings, and smoked paprika. This dish was even better for the Chardonnay than the soup. 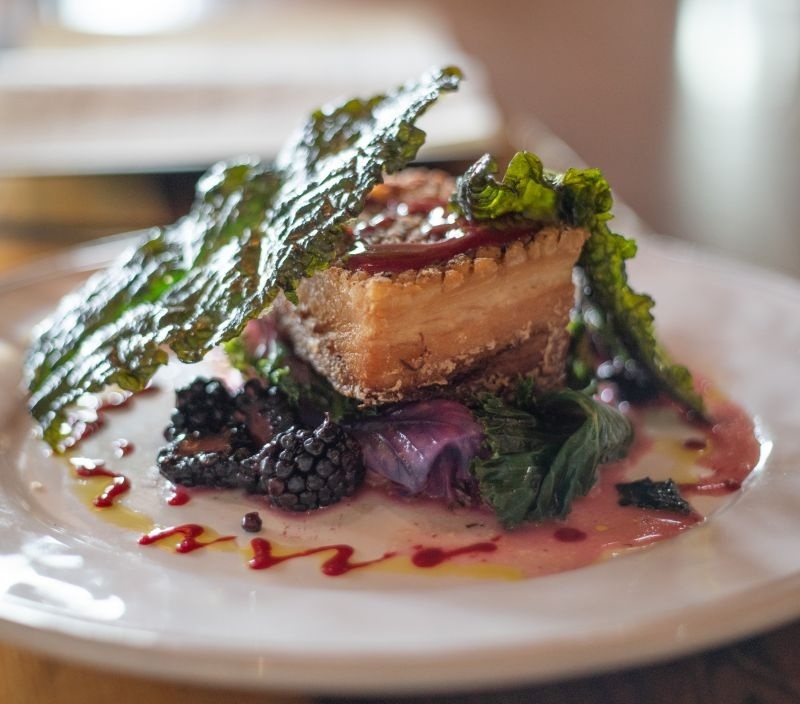 One of our favorite dishes ever – Pork Belly with Blackberries. My main course was braised pork belly, served with garden kale salad, shaved fennel, and blackberries. The pork was melt in the mouth. A glass of the 2015 Grenache was the waiter’s pairing recommendation. The wine is 97% Grenache and 3% Syrah. The nose was of blackberry and pepper. A soft mouthfeel offered great acidity. Led by flavors of blackberry, supported by black tea tannins, and infused with pepper and raspberry. This was a graceful wine, excellent on its own, and splendid paired with the pork belly. The combination lifted by the blackberry notes in both the wine and the food. We finished our meal with coffee. Even this part of the meal was wine inflected. With beans aged for twelve days in wine barrels. I drink coffee black and with no added sweetener. Thus, I tasted a soft sweetness and a hint of oak; enhancing and not detracting from the coffee flavours. 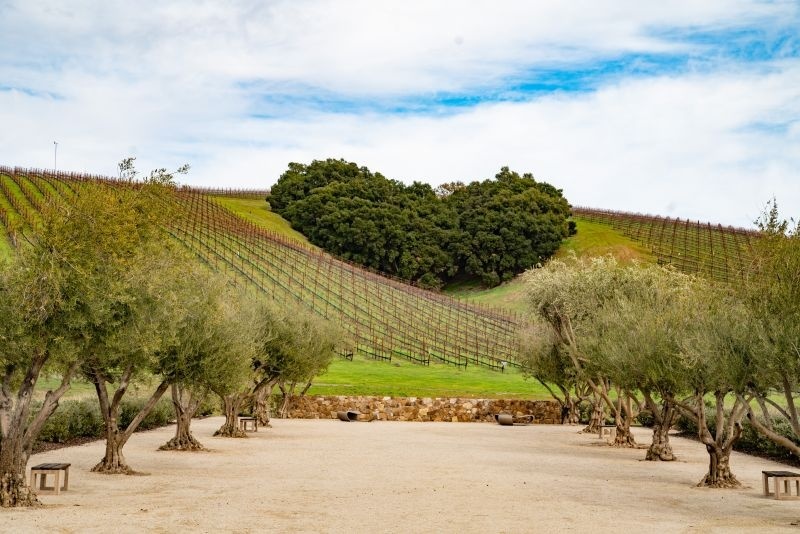 Niner offers a beautiful setting, good wine, and an outstanding lunch menu. We recommend a visit. I have had limited contact with Niner wine at Charleston Wine and Food in 2018. I truly enjoyed and bough a few bottles for later.. Enjoyed the read. One of our favorite wineries. We visit often. They are dog friendly and their customer service is equivalent to their quality of wines. I love their Albarino! And my all time favorite Cab EVER is their 2010 bootjack ranch.